Top Hat. Photos by Max Lacome-Shaw. Top Hat is back on stage and it’s looking as splendidly sumptuous. It has been almost year since the award-winning musical closed in the West End and its producer, Kenny Wax, has used the time to recast and reboot for a huge tour to showcase this heavenly musical. It first debuted in 2011 at Milton Keynes Theatre before a brief tour and a 17-month residency in London’s West End. Wax has since described the original show as “a work in progress” and, after seeing both productions, they are poles apart. It returned to MKT last night at the start of the tour and left the opening night audience with cheesy grins and tip-tapping out of the building as though they knew what they were doing. Everyone now wants to learn to tap after watching a peerless performance from an immaculate cast led by Alan Burkitt and Charlotte Gooch. 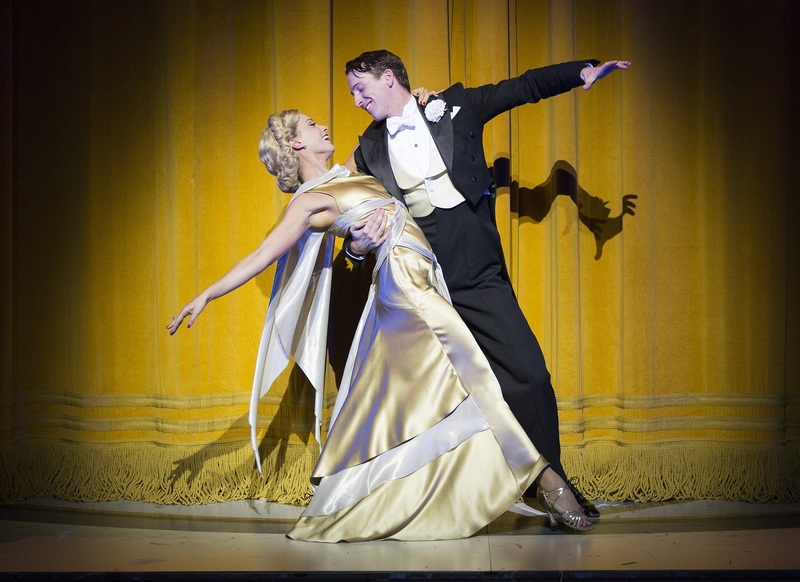 The production, re-worked by Matthew White and Howard Jaques, is based on Irving Berlin’s 1935 RKO Hollywood film starring Fred Astaire and Ginger Rogers. And it has the look and feel of those big budget dance movies where no expense is spared. It’s all there on the stage. The Hildegarde Bechtler sets are lavish and the glamorous costumes, designed by Jon Morrell, are to die for. Add a live orchestra and a large, energetic, cast and this is one marvellous night’s entertainment. Top Hat starts with a bang. 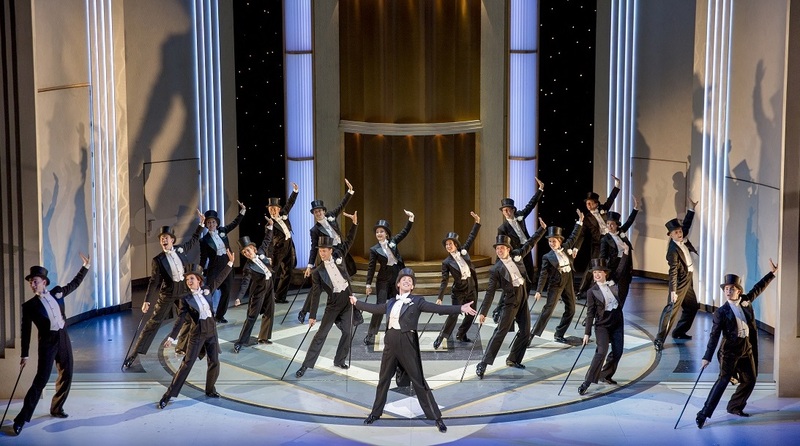 Puttin’ On The Ritz as an opening number is masterly and sets the tone for the rest of the production. The musical numbers in the show are arguably some of theatre’s greatest songs. Among the goodies are Cheek To Cheek, Let’s Face The Music, I’m Putting All My Eggs In One Basket and the eponymous Top Hat. The story revolves around Broadway star Jerry Travers (Burkitt) who crosses the pond to appear in the West End. He’s staying in a London hotel with his producer, Horace Hardwick and gets on the wrong side of a guest (the sparkling Miss Dale Tremont) who is kept awake by his tap dancing. What follows is a beautifully crafted and wonderfully funny love story contained in a tale of mistaken identity. While Travers pursues the initially ice-cold Tremont, Horace and his wife, Madge – the brilliant Clive Hayward and Rebecca Thornhill – lead the comedy subplot. John Conroy, as their butler, Bates, is an absolute treasure, throwing out bon mots, adopting a series of daft disguises and talking in the royal “we”. Sebastian Torkia is a pantomime Italian fashion designer with a streak of Latin preposterousness but his absurd accent and behaviour is hilarious. In-between the feather-light story is the dancing, choreographed by Bill Deamer. 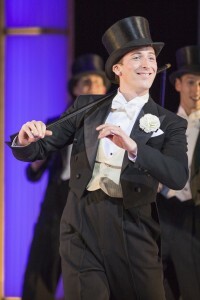 You could sit watching the boyish Burkitt tap-dance all night. He makes it look effortless and he performs every routine with charm and elegance. you’re with him all the way, every low dip of her body and swish of her astonishing dress. Director Matthew White has created a must-see musical that will leave audiences up and down the country entranced. It’s a mystery how the West End could have turned its back on such a quality production. Their loss is our gain. See it. 21-26 Jul, Congress Theatre, Eastbourne. Wow ! Fantastic show, absolutely loved Alan Burkitt and Charlotte Gooch. A great cast giving a wonderful performance. My eyes could not leave the stage. Great colourful costumes and a show leaving it’s audience with hunger for more. Didn,t want it to end. Thank you and well done everyone.